I have recently received many emails and messages asking me about whether starting with raw food is healthy and suitable for kids, concerning babies the most. The simple answer is: ABSOLUTELY! I understand there might be a fear and many questions whether consuming mainly or 100% raw food is healthy for kids and your concerns whether your kids get enough nutrients, especially protein and minerals from raw food diet. I will stop you here and just say that you can become deficient on any diet. 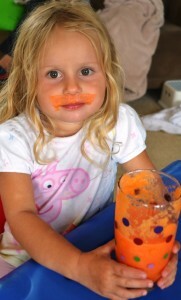 If you’ve already decided to incorporate more raw foods into your kids’ daily diet, it is great! You are the best parents for your kids and if you ever have any doubt, please do not! We are not perfect, but we all love our kids. Please just carry on, be patient, loving and understanding. Ok, now… raw food for kids…I would start with what’s the difference between juices and smoothies in a raw food community as there is sometimes a misunderstanding. I think it is important to mention the difference as you would normally start introducing juices and smoothies to your baby from about 6 months of age or later (I started with Tomas when he was about 10 months old). JUICE – doesn’t contain fibre, meaning that the fibre from fruit and vegetables you use to make your juice is separated from the liquid. Juice can be made by using a juicer (most of the times, especially if you make vegetable juices!). Most of the nutrients from your juice would go straight to your blood stream and leaving your digestive system to have a rest (that’s why juicing is so popular when you want to detox or heal your body). If you make pure fruit juices you need to be careful about high GI (Glycemic Index – sugar level in your blood) due to natural sugars from all the fruits. However, you can reduce the GI by adding leafy greens or other green vegetables such as broccoli, cucumber etc. If your baby or child doesn’t like the taste, just be patient or add some water to the fruit juice (50% juice, 50% water). SMOOTHIE – does contain fibre from whatever you use for your smoothie as you do not separate the liquid from fibre. You would normally use either a blender or a food processor to make a smoothie adding fruit and vegetables and a bit of water, coconut water, raw nut or seed milk or fresh juice. Consuming fibre is very beneficial for your digestive system. Now, what else is fibre good for? There are several types of fibre that function differently and provide distinctive health benefits. You may be familiar with the terms “soluble fibre” and “insoluble fibre,” but within each category there are many different fibres. Soluble fibres bind with fatty acids and slow digestion so blood sugars are released more slowly into the body. These fibres help lower LDL (bad) cholesterol and help regulate blood sugar levels for people with diabetes. Insoluble fibres help hydrate and move waste through the intestines and control the pH levels in the intestines. These fibres help prevent constipation and keep you regular. 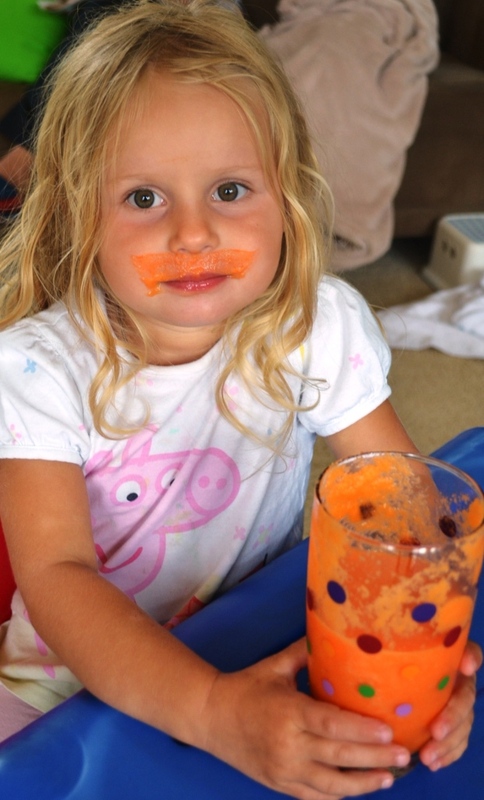 Our family prefers smoothies to juices as they fill you up more and contain so beneficial fibre. 1. Start your day with a green smoothie! Teach your kids that the green smoothie (or dinosaur smoothie or whatever you call it) give their little bodies a power and their body will thank your kids for looking after it so nicely 🙂 Our kids prefer green smoothies to juices. You can keep the smoothie in a fridge for a while, but don’t leave it for very long! I would say just an hour or two max. The best practice is to drink it immediately after you made it. If you have a small baby, just start with fruit & vegetable juices (not too sweet, please). One teaspoon in the beginning is a great start and you can increase the amount gradually. The same apply with smoothies. Please, do not expect your child to down a full glass of green smoothie when he/she sees it for the first time or that your little baby will like everything. It took us almost a year with Eliska to drink 350ml of a green smoothie and Tomas currently drinks about 150ml in the morning and the same amount in the afternoon (he is still not into solids that much and prefers breast milk). If you still breastfeed, please, please carry on 🙂 It is the best! However, if you cannot breastfeed for whatever reason, you can give your baby coconut water which is nutritionally very similar to breast milk or you can easily make almond or coconut milk (I would avoid nut milks at this stage as your baby might have an allergic reaction). If you add a bit of chia seeds (you can simply blend them with your fresh milk for small babies) you will end up with a great porridge rich on calcium as well as protein. 2. To have a variety in your raw food diet, make fresh fruit & vegetable juice 3x per week (our kids don’t like vegetable juices that much so we rather make a fruit juice and add just a little bit of cucumber OR beetroot (which gives the juice beautiful pinkish or red colour), broccoli, spinach or kale. Again, you can keep your fresh juice in a fridge, but not too long, please as it would lose most of its nutritional value. 4. You can add some supefoods such as chia seeds, spirulina, chlorella, acai, hemp seeds, marine phytoplankton just to list a few to your smoothies or juices to make it more nutritious and interesting. Lots of successful juicing and smoothie making and if you have any related question, please comment below and I’ll come back to you.